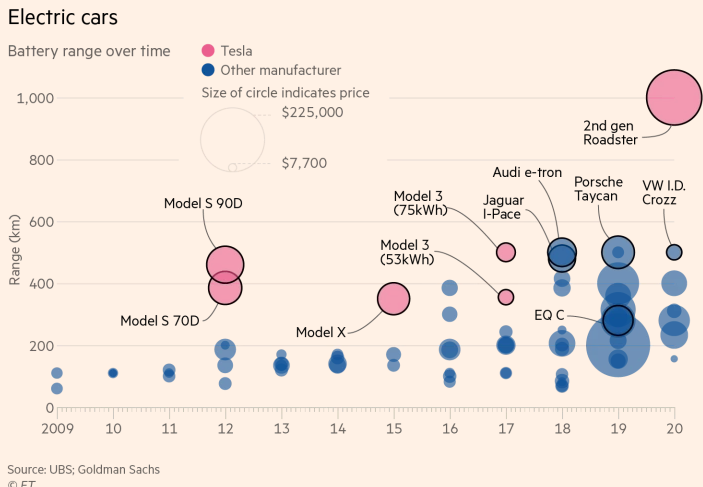 Tesla and its enfant terrible Elon Musk have brought massive disruption to the car industry by introducing its line of electric vehicles (EVs) that might mark the ultimate advent of vehicles powered purely by electricity to ordinary consumers. The quakes produced by Tesla’s offensive are certain to knock off at least some of the incumbent car producers. A growing body of observers voices its concern that it is the German manufacturers that would suffer the heaviest casualties. 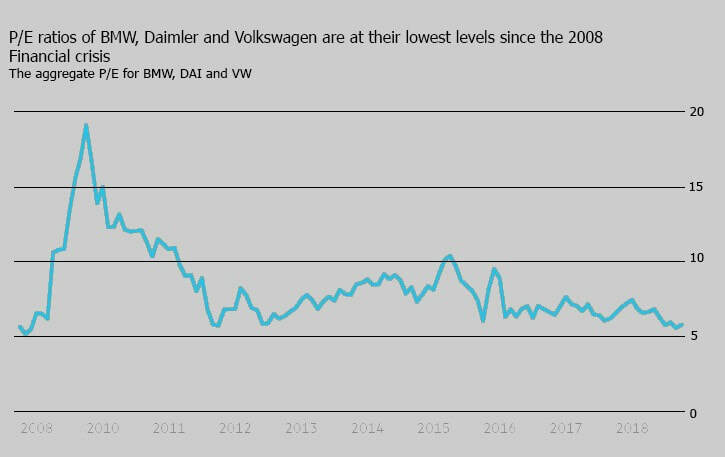 The market’s expectation of the lackluster future for the German carmaker giants is best illustrated by the P/E ratios of BMW, Daimler, and Volkswagen, currently at their lowest levels since the 2008 financial crisis. This is in line with the pricing of stocks of established car producers, which are the most depressed on the S&P 500, Xetra DAX 40, and Nikkei 225. ​Per car decomposition figures serve as an explicit evidence of this skepticism. VW has a market value of €6,500 for every car it sells, whereas this figure is €235,000 for Tesla. An even more stark difference is evident from the enterprise values per vehicle, which equals € 520,000 for Tesla, 13 times the number of BMW. There are several factors that serve as the main drivers behind such discounts. 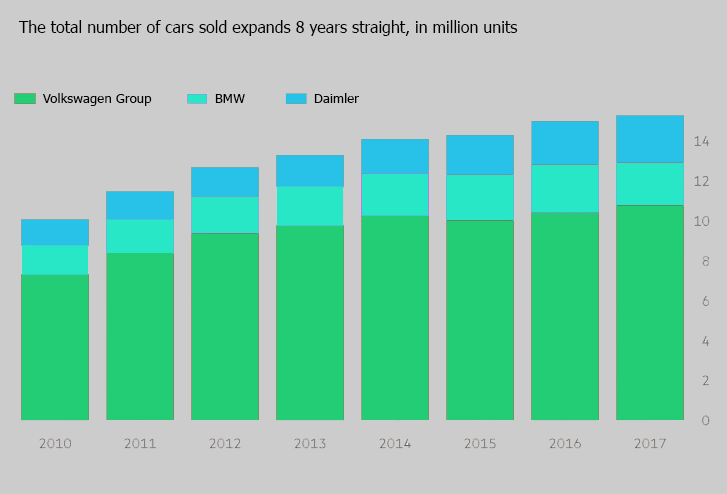 First of all, despite the record numbers of vehicles sold by German companies, in a winning stream for eight years in a row, the market remains exceedingly skeptical about their future growth trends. ​The market for EVs is expected to grow exponentially in the next decade with the share of electric vehicles sales as a percentage of total vehicle sales equalling almost 20% in 2025. This is in sharp contrast with the forecasts for the number of internal combustion engine cars, expected to experience a steady decline after so-called “piston peak” in 2030. The decline is set to deliver a heavy blow to VW, BMW, and Daimler, who are yet to present a coherent structural response to the advance of EVs. Correspondingly, this is translated into revenue hitting its apex in 2022, and flat post-2020 earnings projections for the German trio. ​“Nobody can say we are sleeping like a bear” denied Bernhard Mattes, Chairman of the German Association of the Automotive Industry, who dedicated more than 30 years to the automotive industry. However, Mr. Mattes defensive reply is far from being able to quell the market disbelief about the ability of BMW, Daimler, and Volkswagen to adapt to the possible swift structural transformation of the industry. Although EVs serve largely identical functions and possess the same exterior as their conventional counterparts, the production of EVs is distinct. The cutting-edge technologies, supply chains, and highly specialized set of engineering skills required for combustion engine cars that BMW, Daimler, and VW currently retain might suffer the erosion of importance relative to software and battery manufacturing. A radical and abrupt shift would, as EY claims, “render the entire industry obsolete”. The absence of battery production infrastructure is another key characteristic of the three car giants. Although there are some steps taken in this direction, the adapted solutions are more of a short-term nature. For example, VW had signed a contract with China’s CATL, whereas BMW struck deals with Jiangxi-based Ganfeng Lithium, and South Korean LG Chem and Samsung SDI. The production of batteries, a vital irreplaceable component of EVs, is a headache not only for German carmakers but a systematic weakness of the EU. The EU accounted for only 4% of battery manufactured in 2017, whereas China was responsible for more than two-thirds of total output, with the remaining portion being mainly divided by Japan, South Korea, and the US. Nevertheless, in the next two years a number of electric vehicles produced by the German trio will hit the market signifying a late response to Tesla, among which BMW’s i3, Audi e-tron, Porsche Taycan, and VW ID. However, according to UBS, Tesla holds a significant technological advantage over the competitors, and there is no expectation of the upcoming of a “Tesla killer” in the foreseeable future. The current solutions presented by the German incumbent producers are either unable to deliver the same battery range as Tesla’s Model 3 or have a significantly higher price. However, it is surely too early to claim that the death of the German industry is close and inevitable. There are several factors that could prompt the German carmakers to eliminate the current gap, or even overcome Tesla in the long run. First of all, the established position of incumbent car manufacturers might allow them to employ their vast resources to overhaul their production facilities to produce electric vehicles in high volumes. BMW, VW, and Daimler have accumulated more than € 60 billion in net cash, which they might exploit to pursue Tesla. Volkswagen Group has already pledged to spend € 34 billion through 2022 to accelerate its offensive into battery-powered vehicles, autonomous-driving features, and ride-hailing systems. Similarly, Daimler announced its plans to invest at least $ 12 billion into the electrification of its range of vehicles, from compact commuters to heavy-duty trucks. Secondly, although Tesla might be the pioneer of the EVs, it is yet to achieve the revamping of facilities to produce electric cars at scale and for profit. As Henry Ford’s introduction of Model T in 1908 demonstrates, the ultimate automobile revolution was not brought by the introduction of a car, but by the system that made it standardised, affordable, and mass produced. The next few years will be fascinating for the carmaking industry. The time will show whether the German producers will be able to dethrone Tesla or repeat the fate of Nokia, which fell prey to Apple’s iPhone.